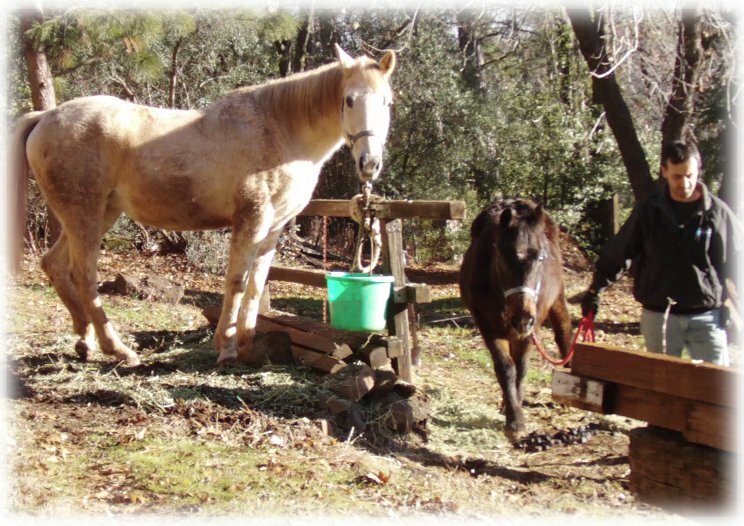 This evening there is only $340 left to raise in order to reach the goal of $5,000 for the rescue and care of horses dumped at livestock auctions this month. You can make it happen! Every dollar helps! We received a great update from Rosie Posie’s adoptive family today. She is doing absolutely great and they are madly in love with her! Thanks for giving her such a great home. For those that do not remember Rosie’s story, she was rescued from Orland Livestock Exchanged by Agent X a couple months ago. The only other bidder was a kb, so we are very glad that she is enjoying life instead of feeding a wealthy foreigner. 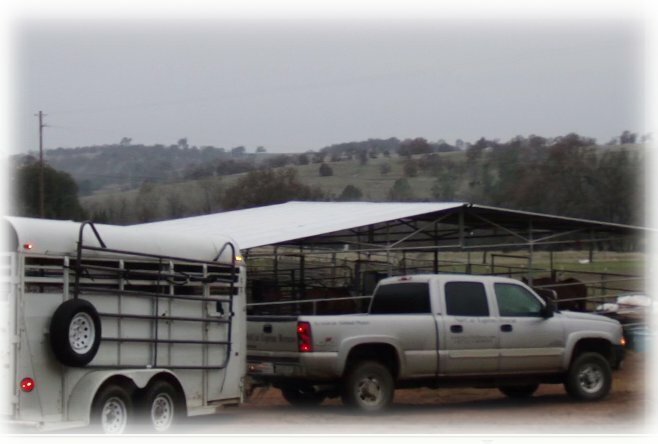 Early this morning Jason loaded up the panels onto the side of the trailer, hooked up and headed out to pick up 3 horses. One of them we were told was very wild and wasn’t used to being handled and we would have a very hard time loading her. He headed out to meet up with Ron who would be assisting him in picking up the horses today. 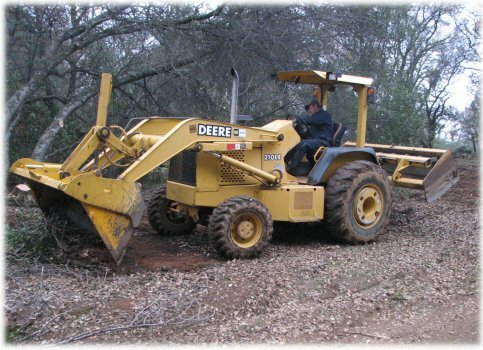 Around 8:00 am the tractor showed back up to smooth out the new road base. These two horses belonged to a family, but then the kids got older, moved away from home, and now their caretaker is moving too. He has been looking for a home for the horses, but has been unable to find one. He called Home at Last, but they were full, and so he had two options left: we take them in or he would be forced to shoot them. He simply did not have the financial means to have them humanely euthanized. Donna, from Home at Last, called us up, and we started making arrangements for them to come to the rescue under the Last Act of Kindness program. 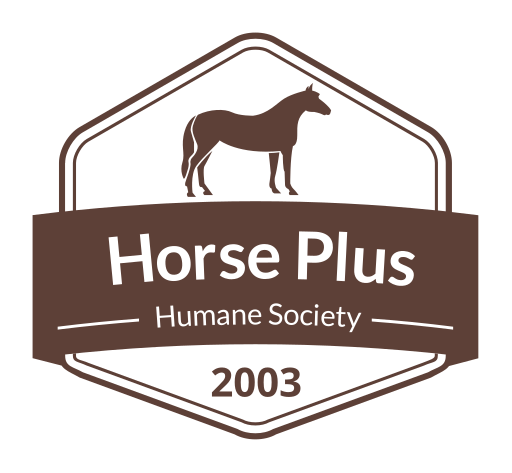 We believe that horses should only be shot under an extreme emergency when no veterinarian is available to rend re humane euthanasia. Most people do not know how to properly shoot a horse, resulting in an agonizing end. And while we have training, we have had no practice, and quite frankly we never want to. The white horse below, who was born on the property and had never left until today, is the one that was hard to handle, and the one the panels were loaded up for. But, thanks to Jason and Ron’s experience, she loaded right up without much of a fuss at all. She is extremely pushy and hard to handle on the ground however. With her friend already in the trailer, she wanted to get in to be close to her lifetime companion. 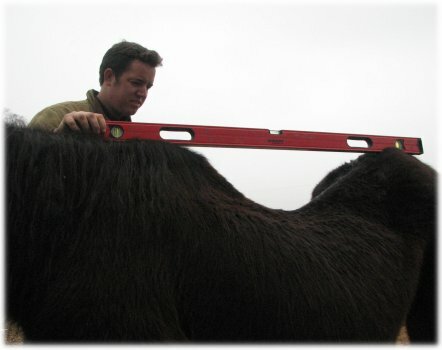 From the two horses above, Jason and Ron headed over to another house to pick up this extremely sad horse. 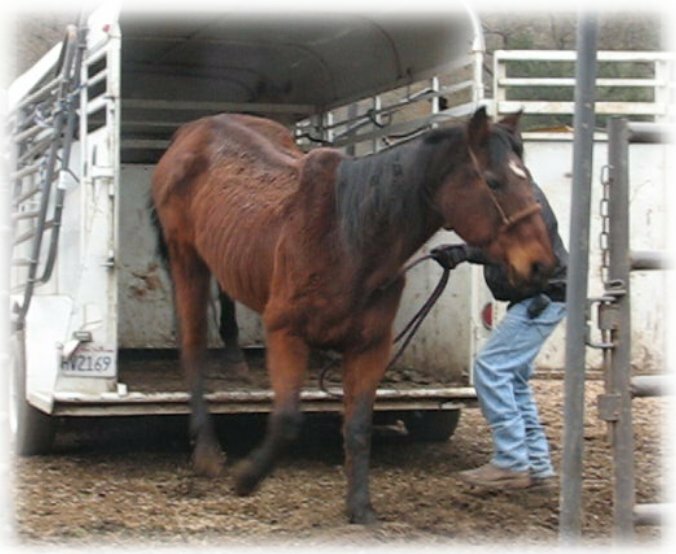 Animal Control called us the other day to ask if we could possibly take in just one more horse… This lady was not caring for her horse properly, and due to him being underweight, it was very concerning. He is an old rodeo horse, supposedly he has won over 90 championships. 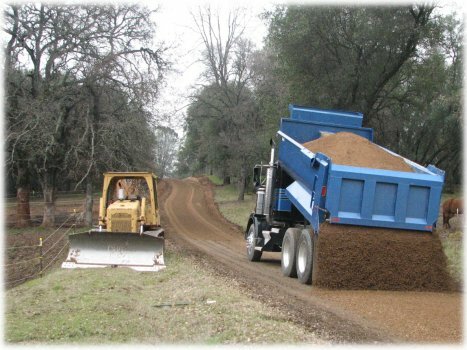 Meanwhile back at the rescue gravel was being delivered and spread on the improved road. 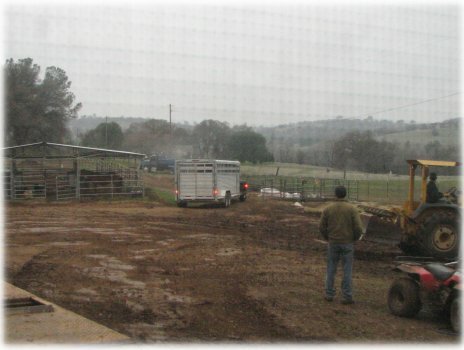 The horses arrived at the rescue and were safely unloaded. This is the old mare that was with the white horse at the first stop that was going to be shot. It was hard to tell how old she was from just looking at her, but she looked really old. Tawnee noticed she is a Mustang, so she eagerly shaved down the brand and read “77” as the birth year. Wow, she’s almost 32! She is one of the more unique horses that we will always be able to remember. 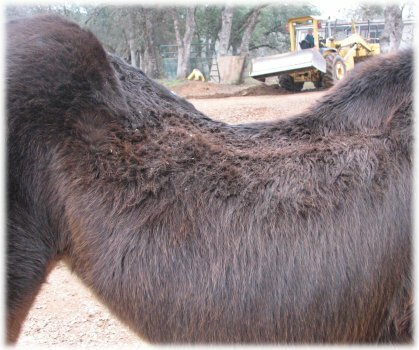 We’ve never seen a horse with such a swayed back. We brought her back out of the resting pen where horses go when they first arrive, to get some more pictures of her sad back. Jason decided to bring a level out to see just how swayed she really was. It’s just incredibly sunken. This poor gramma, it’s just really terribly sunken. After the horses were brought back to the rescue Ron helped out for awhile and then hooked up Big Silver and headed out for his house. He’ll be leaving early tomorrow to pick up some horses. It’s a good thing he did take the trailer home with him, on the way back he found an abandoned/lost horse on the road. So he stopped, loaded him up, and headed on to his place. The horse will be coming here hopefully tomorrow. 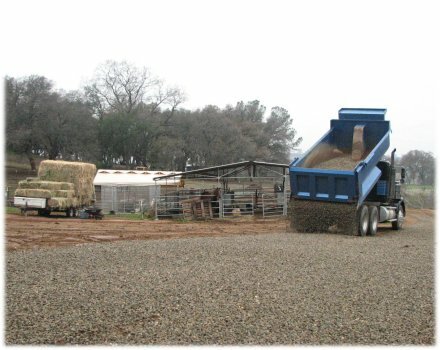 We also had some gravel brought into the parking area. 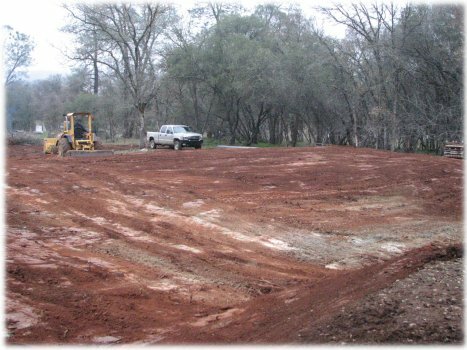 With all the rain we have had this winter it is turned into a slippery mess. But, it is messy no more. When Deb parked on the downhill side of the parking lot last Sunday, we joked with her that someone was probably going to slide into her truck. Thankfully it didn’t happen, but it really wasn’t a joke. And this is the hay barn pad, all finished and ready for post holes to be dug. We are so excited! It is taking longer than expected, but it is getting ready to go up! It looks cold there. Do all of you have enough warm coats and things to keep you warm and healthy? You do so much to save the critters that we would hate to have you guys get sick from the cold. If you need some, just say so! We will see what we can do to help with that. Also, do all of your kids have warm things to wear? Being a not-for-profit, I know that you are not rich. God bless you guys! I think it’s great these horses are getting another chance, however I also have to commend the man who was going to shoot them. 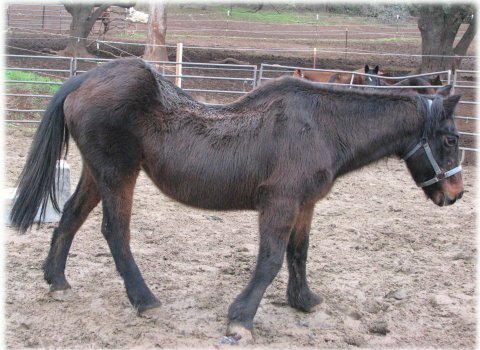 Too many people are abandoning, neglecting or auctioning off horses they can no longer afford. For me personally, I prefer a well placed bullet to an injection. Both should be classified as humane euthanization. Chemicals don’t have a monopoly on that one. In fact, when a friend of mine had to put down the horse that “raised” her a reputable vet administered the injection and it was anything but quick, and I’d imagine, painless. My mare was gone before she hit the ground thanks to my vet and his handgun. Oh my gosh! what the heck happened to that poor mare to make her back so swayed!? What is going to happen to her? poor thing, she looks like a sweetie! Yes, we are all quite warm usually. We actually wish it would rain some more so that California does not blow away from the dust this summer coming up.We have no idea how the poor mare could have gotten such a swayback. We would love to learn how ourselves. We are still evaluating her for quality of life, but being that she is 32 the kindest thing to do may be to allow her to go to sleep peacefully. She is such an incredibly sweet girl! 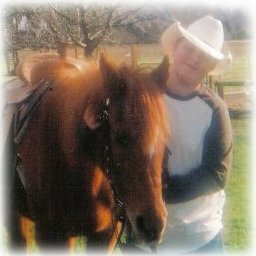 However it goes down with the ancient mustang mare, blessings on you for giving her a decent end of life.I have a venerable old mare myself and focus on giving her quality of life until she shows me she is ready to go. It isn’t easy, as she was badly abused before arriving here and unwinding the trust issues is a big undertaking.